You may be able to remove an enrollment in your course within your course Settings in Canvas. Removing an enrollment deletes the enrollment from your account, but admins can view these enrollments as deleted enrollments in account-level reports. Users removed from a course do not have any record of participation in the course. You may want to conclude or deactivate the enrollment instead. To see course participation for a deleted enrollment as compared to other enrollment types, view the Canvas Enrollment Status Comparison PDF. Removing enrollments is a course permission. If you cannot remove enrollments in your course, your institution has restricted this feature. Enrollments may be added by your institution's student information system (SIS). If an enrollment includes an SIS ID, only admins can remove an enrollment from the course. 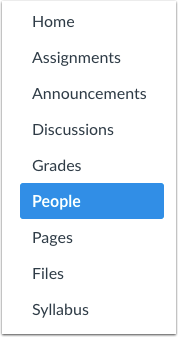 Click the user's Options icon , then select the Remove From Course link . Previous Topic:How do I view concluded enrollments in a course? Next Topic:How do I link a student to an observer in a course? Table of Contents > People > How do I remove an enrollment from a course?